Ashley Harlow (No.46 in the list of male British team members) was born in Kent on 3rd January 1970. 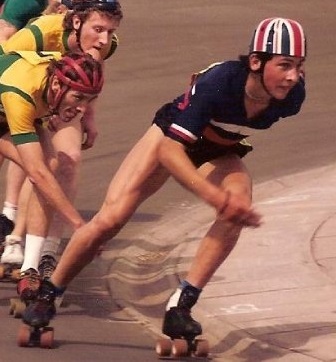 What started out as a bit of fun for young Harlow would see him become one of Britain's most gifted roller speed skaters ever to have graced a track. 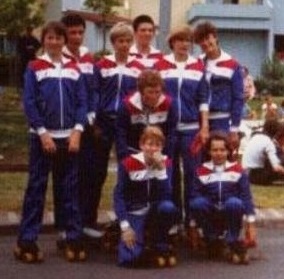 Like his older brother, Rohan, Harlow started his skating career with the recently formed Herne Bay United club in early 1977. Under the watchful eye and coaching of former British Mile Champion, Jim Lipyeat, Harlow was soon showing his talents, albeit he was still only 7 years old. The first record we have of Harlow competing was on the 1st May 1977 at the Eastways cycle track in London (which has since been dug up and now is the site of the Olympic velodrome). The race was hosted by Anglo Daor and was over just 200 metres. Harlow would not feature in the top three, but his brother would come home with a silver medal in the same event. Harlow skipped the British Championships that year but his second race on 22nd May at Abbey Park, Leicester, saw the first of many beaurocratic battles the youngster would have with the establishment. Due to a mix up in entry forms Harlow, and the other skaters from his club, were refused entry into one of two races for the event. The result was that none of them could possibly win or get a position in the overall standings which was calculated on points from both races. It is doubtful the then 7 year old would have had a clue what was going on, but controversy would paly a major part throughout Harlow's skating career. Harlow's first medal came just a few weeks later on 19th June when he returned to Abbey Park to take part in the Mercia International. Just two months on from that and Harlow recorded his first victory. It was 13th August and his club had put on a race event. Skating in front of his home crowd for the first time Harlow would take home his first gold medal. In 1978 the club changed it's name to Herne Bay Flyers. Over the course of the next 10 years the club would rise through the ranks to become the most successful clubs in the country and Harlow would help cement that recognition. 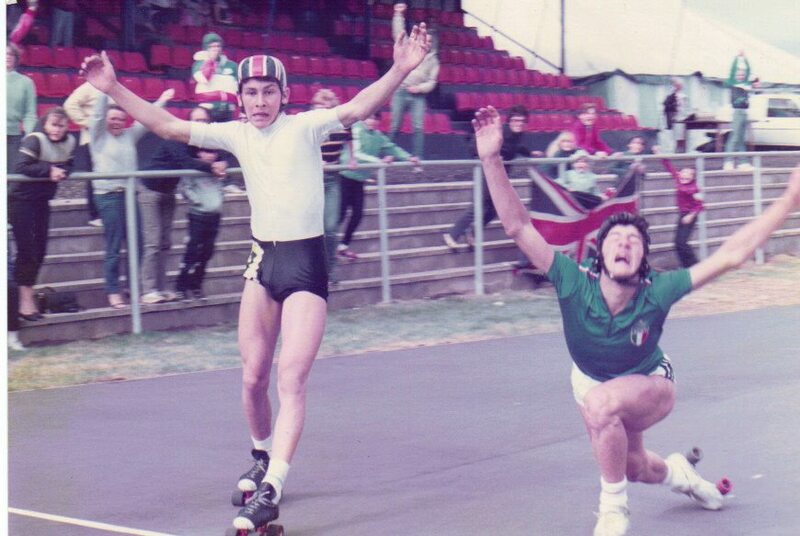 Harlow's first shot at a British title came on 16th July 1978 in the Junior Boys 7-11 years age group over 500 metres on the Southampton track. Harlow didn't feature anywhere in the medals (the event actually being won by his brother). However, a return to Southampton a year later saw Harlow take his first British Championship medal in the same event. His silver medal gained by finishing just behind his older club mate, Paul Turner, was all the more remarkable considering that Harlow was still only 9 years old and was up against much more developed skaters. (At that time the age groups were quite wide with regards to British Championships and it was unlikely that any 7 year old would be any serious threat to any 11 year old in the same event. Thankfully, that all changed in 2000 when Britain adopted age groups as used on the continent). A year on from that and the finishing positions were again Turner first and Harlow second, but in 1981 the event was all his for the taking. Now aged 11 Harlow took his first British Championship gold medal with a win in the Junior Boys 7-11 years 500 metres on Palmer Park, Reading. The following year, however, he again did not feature in the medals having moved up an age group to the 12-15 year olds but the year after that, 1983, was to be a pivotal year in his skating career. Early in the year he had been dominant in all domestic competitions and come the Junior European Championships in Nantes, France, his name was on the team sheet. He came away from these championships as the highest placed British skater with a 5th in the 500 metres on the road and 4th in the 3000 metres on the track. By the time the British Championships came round just a few weeks later, he was the man to beat. On 17th July on Palmer Park the scene was set for Harlow to take his first 12-15 years British title. 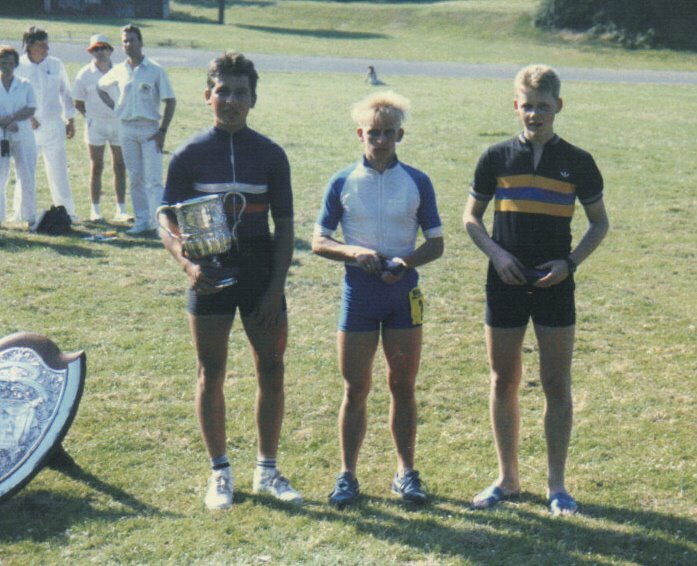 What he didn't bank on was an in form Hugh Doggett (Anglia Rollers) and in the only Junior Boys Championship held that weekend it was Doggett who snatched victory from Harlow. It was an unexpected blow for Harlow and a shock result, but no less deserved by Doggett. The following weekend saw both the 300 metres time trial and 3000 metres British Championships held on Tatem Park, London. This time there was to be no mistake. Harlow took both gold medals emphatically wiping away any bad memories from a week previous. It was the first time a time trial event had been introduced as part of the Junior British Championships and Harlow cemented his name into the record books as the very first winner and was the only junior skater to go sub 30 seconds (29.76 seconds) for the distance that weekend. If, however, one can say a single year belongs to any particular skater then 1984 belonged to Harlow. The first round of British Championships were held in early June on the new Birmingham Wheels track in anticipation of the Junior European Championships which it would be hosting in just a few weeks time. One more Harlow was selected for his country but the small matter of the British Championships had to be resolved first. Harlow won the Junior Boys 300 metres time trial in a time of 30.30 seconds, a full 1.5 seconds faster than his nearest rival. Even more remarkable, though, was that his time would have earned him a silver medal in the senior men's event, being a tenth quicker than fellow club mate and senior skater Ian Ashby, who just 12 months previous had set an "unofficial" world record in the same event. Only John E. Fry would go quicker than Harlow that weekend and he was still only 14. He was going into the Junior Europeans in his home country in great form. The Junior European Championships on the road started on the 8th July at Sutton Coldfield, Birmingham. First up was the time trials and Harlow would come in 4th equalling his best performance so far in a major championships. Next up that evening was the 10000 metres. Harlow was a renowned sprinter and nobody expected great things of him in this event, but he came away with a silver medal and suddenly he was full of confidence. Anything was possible. Day two started with the 500 metres. Harlow reached the final along with three Italians and a Spanish skater. The odds were heavily stacked against anyone other than Italy winning, although Harlow knew he was in with a shout of another medal. In the final straight there was some bumping and barging but Harlow still managed to cross the finish line second, a tenth of a second behind Italian skater Paolo Barbon. Then the announcement came - Barbon had been relegated one place for an infringement propelling Harlow into first place. Harlow had done it. 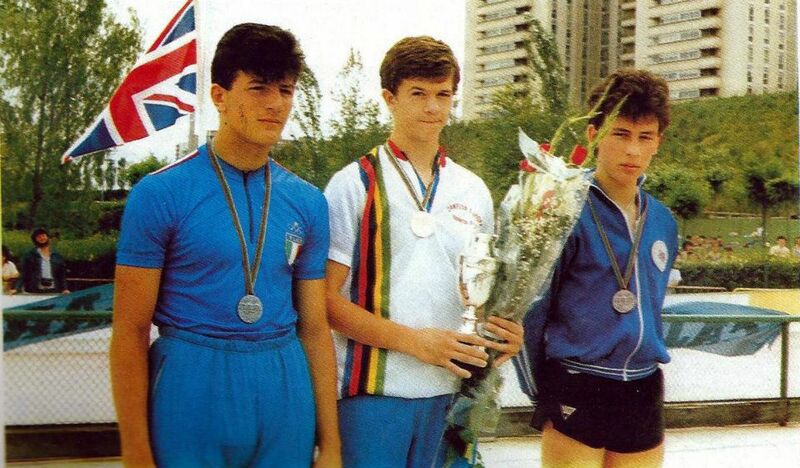 He had become the first British junior to win a European gold medal. Later that evening was the 3000 metres and Harlow would be pipped for yet another gold by the narrowest of margins when Manuel Camporese (Italy) finished just one hundredth of a second ahead of the young Brit in a photo finish. The final day was the 5000 metres and everyone was now expecting at least a medal from Harlow. He would finish fourth, almost a disappointment, but understandable on reflection after a tiring three days of solid racing. His consolation was to finish first in the overall standings on the road, but with two days rest ahead of him all thoughts now turned towards the track. The first event was once more the time trial. Harlow was streets ahead winning in a time of 29.74 seconds. His time was not just excellent, it was outstanding. At just 14 years of age he became not only the first British junior, but the first British skater to officially go sub 30 seconds on the track. 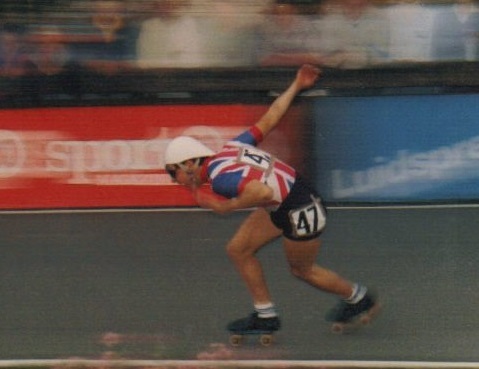 The second placed skater, Rodolfo Trumpy (Italy) was more than half a second behind him with a time of 30.30 seconds, equalling Harlow's Junior British Championship time of just four weeks before. Day two of the track started with the 500 metres. Again Harlow was in the final and again it would go to a photo finish between himself and an Italian, this time, however, it was Harlow with yet another gold medal just one hundredth of a second ahead of Fabrizio Canocchi. The evening saw the 10000 metres unfold and Harlow come home 5th in what would be his lowest placing of the competition. The third and final day of racing saw it start with the 3000 metres, Harlow coming in 4th, but the last race saw yet another medal for the youngster as he took a bronze in the 5000 metres. Once again he was crowned overall champion, this time on the track. With no fewer than three gold medals, two silver and a bronze, the Championships surely belonged to him. Not since Jimmy Reed at the European Championships in Stuttgart, Germany in 1936 had any British skater won more than two gold medals in any one championships and Harlow remains the only post-war skater since to have achieved that feat. Approaching his 15th birthday Harlow requested permission to enter the senior ranks early, as his brother had done a few years previous. There was no good reason for him not to and permission was duly granted. On 31st March 1985 Harlow took part in his first ever senior race at the Moselle Leavers Centre for the North London event, the Hewitt Cup over 1500 metres. Harlow won. In July he was once again in the Junior British team for the Junior European Championships in Pamplona, Spain. It is fair to say he was not as dominant as he was 12 months previous, but he still came away with two bronze medals (5000 metres track and 300 metres time trial on the road) as well as three 4th places. A week on from those Championships he was back racing in the British Championships. On 13th July 1985 Ashley Harlow became the youngest senior British Champion when he won the 5000 metres on Birmingham Wheels. His record eclipsed his own brother's record by some 43 days and he remains to this day as the youngest male skater to win a senior British title - aged just 15 and 191 days. This triumph meant that he was now being considered for a place on the senior national team and so it was that he joined the likes of his brother Rohan, John E. Fry, Andrew Newton and John Mullane on the plane to Cassano d'Adda for the European Championships. Cassano d'Adda was a baptism of fire for Harlow. He would still come away with a creditable 11th place in the 300 metres time trial on the road, but other results made him realise there was a big gap between Junior and Senior level at that time. That said, the very last event, the 10000 metres 3 man relay, nearly turned Harlow into a skating legend for that race alone. Harlow teamed up with John E. Fry and Andrew Newton for the race. Britain were actually defending champions with Fry being the only member of the winning team from the previous year. This year, however, Britain were nowhere near favourites. The road in 1984 was a "goat track" and favoured attrition over speed. Here, in Italy, the road was smooth, it was big and it was fast. The speed suited the Italians and French whilst the size suited the big long legged Germans. In the closing stages there were just four teams in with a shout, Italy, France, Germany and Britain when France fell and seemed out of it. A medal was now certainly on the cards. France, however, were not yet beaten. They picked themselves up and clawed their way back into contention. As the laps came down Germany put in a big effort and gapped the field. Italy responded and chased them down leaving Britain and France to contest what seemed like third place. As the Italians and Germans approached the finish line in what appeared to be the final sprint the bell was rung for the last lap. Both German and Italian skaters suddenly found themselves with another lap to do. Britain and France both made the changeover and came onto the Germans and Italians like a steam train. Harlow was skating the anchor leg for Britain. As they came into the final bend all four teams were neck and neck but 15 year old Harlow swept around the outside of them all and crossed the line first with his arms aloft (you can catch the video footage here on the "VIDEOS" page). The unthinkable had happened. Britain had not only retained their title but they had done so with a team consisting of John E. Fry - a 36 year old veteran skater whose first World Championships had been in 1969, Andrew Newton - a just 17 year old in his first senior European Championships and Ashley Harlow - a 15 year old who was still at school. Then came the kick in the teeth nobody was expecting. Italy put a complaint in that the race had been run over one lap too many. They had a point as yes it had. Britain countered that this was irrelevant as any skater knows you should always skate to the bell. They too had a point as yes, you should. The deliberations by the judges went on for some time and eventually the decision was made. The race was declared a "non event" and as such the 1985 European Road Relay Championship for senior men would not be included in the history books. And so it was, Harlow had crossed the line for Great Britain in what has now become known as "the race that never was". A few weeks afterwards Harlow was once more on a plane with the British team, this time to take part in his very first World Championships in Colorado Springs, USA. Harlow would struggle to break into the top 20 in any of the events he skated, but once more teaming up with Fry and Newton he would help the team finish a respectable 8th in the relay. Considering that there were over 20 national teams all on the track at once this was no small feat. The climax of the season saw Harlow also win the 10000 metres British Championship and go on to help his Herne Bay team mates secure victory in the Chamber Trophy Team Championship as well as win the coveted Burgoyne Shield for the British Relay Championship. It was a golden time for the Herne Bay youngster. The 1986 season started well for Harlow but soon we began to see the emergence of the so called "strength skaters" back home in Britain. Most notably the likes of Mark Tooke, Andrew Newton and Hugh Doggett who only knew one thing. Attack. Not known for their sprinting ability they knew that the only way to beat the likes of Harlow was to take the sting out of them. One after one they would attack the field making the others chase them down and more often than not the tactic worked as they found themselves frequently a lap ahead of the field. Harlow still managed to pull out the odd victory but it was also exam year for the youngster and the pressures came from elsewhere. Then on 29th June things really took a turn for the worse. Skating on his home track, the recently built banked track in Westbrook Lane, Herne Bay, Harlow had already secured a victory in the 5000 metres 2 man relay alongside his brother and made his way into the final of the individual 5000 metres. In the final, however, Harlow came to blows with another skater, Richard Hartley (Milton Keynes). Both skaters would see themselves disqualified but Harlow's punishment went one further and he was shown the 'black flag' during the race. Any skater who receives this must leave the track immediately and it is usually followed up with a lengthy suspension. This was no exception and Harlow was given a three month ban for his involvement in the altercation. This ban ruled him out of the 1986 British Championships and left Harlow unable to defend his two titles. It also left him out of contention for any possible inclusion into the British team that year. It was a bitter blow. Harlow's first race back after suspension on 21st September saw him help Herne Bay win a club relay event held by Alexandra Palace at Tatem Park. A week after that and it was Championship gold again for Harlow and his team mates in the Chambers Trophy and Relay Championships. Further, the time trial Championships had been deferred from June until October due to a technical issue with the timing equipment. Here was an opportunity for Harlow to at least come away with something from the season. However, the roller speed committee stated that his ban had been in force at the time of the original scheduled day of the event and as such he was ineligible to compete in the now rescheduled event. Conspiracy theories were abound, but for Harlow it meant just one thing, 1986 was a write-off. In 1987 Harlow emerged all guns blazing. The three month suspension had certainly not quenched his desire for success. Domestically he was on a high winning a glut of races, and in July he was again crowned British Champion, this time in the 1500 metres and 5000 metres. If Harlow was still in the pack at the finish there was only likely to be one outcome. His performances again earned him a place on the national team. He would have a highest finishing position of 6th in the time trial on the road at the European Championships in Ostende, Belgium and an 11th place in the 500 metres at the World Championships in Grenoble, France. On his return he added the 300 metres time trail British Championship and the Southern Counties Championship to his already impressive collection of victories. Harlow was back. Taking a sabbatical from racing he trained hard through the winter and readied himself for the 1988 season. It was a full 7 months before Harlow took to the track again, starting his season on 8th May at Tatem Park. Straight away he was back to winning ways. 1988 also saw the emergence of another skater, Tony Marriott. Marriott had been in the junior team when Harlow was victorious in Birmingham but had not featured himself with average finishing places. Since then Marriott had slowly gone about his work and in 1987 had won his first British title, the 20000 metres, but he was still playing second fiddle to Harlow. Marriott had also made the team for the European and World Championships in 1987 but his European performances were again average whilst a broken collar bone in team training in Grenoble halted any chance of taking part in his first Worlds. By 1988, however, Marriott was getting noticed and vying to topple Harlow as Britain's number one skater. Throughout the early part of the season the pair were evenly matched. Harlow's speed versus Marriott's strength meant for some exciting racing, however, the big events general fell to Harlow. In June Harlow finished ahead of Marriott by one hundredth of a second in the prestigious Invitation Five Mile and then in July would win the 300 metres time trial, 1500 metres and surprisingly the 20000 metres British Championships as well as the Southern Counties Championship. Marriott, by contrast would only win the 10000 metres and the lesser recognised Open Handicap Championship for the Jesson Cup. Both skaters found themselves once more in the British team for both European and World Championships. First up was the Europeans and Harlow squeezed out a 4th place in the 500 metres on the road setting a new British Record in the process. (A record, incidentally, which stood for some 21 years - even after the introduction of the much faster inline skates just four years after Harlow set it). But it was Marriott who would come out on top from these Championships with a silver in the 10000 metres on the road and a gold medal from the relay on the track. Harlow, himself though, would finish in the top 10 in six of the events he skated. The World Championships saw a return to Cassano d'Adda, Italy. Harlow would equal his World Championship best position with 11th in the 500 metres. The last event was the relay and with two of the current European relay gold medallists along side him, John C. Fry and Sean McGeough, Harlow set about trying to put right the events of the European relay that had taken place on this very circuit three years previous. It wasn't to be as the team came home 10th. As he stepped off the track Harlow could never have guessed that this would be the last time he would put on a Great Britain skinsuit. On his return from the World Championships Harlow once again found himself in trouble. This time at an inconsequential domestic race meeting Harlow was adjudged to have sworn at an official. The result, another three month suspension. It was to have a profound effect on the 19 year old. Again conspiracy theories were abound. Marriott's mother was on the speed committee and his coach was also national team manager John "Dai" Davis. Many thought that Harlow was being kept at bay deliberately, but reality showed that Harlow was not averse to expressing his opinion. His father, John, was well known for his outbursts and Harlow junior was off the same stuff. That said, many still thought the ban to be somewhat harsh. Luckily it had come at the end of the season and Harlow could continue his winter training and not miss out on any major competitions. Throughout the early part of 1989 there had been a few national squad sessions but on March 18th 1989 Harlow was once more allowed to become part of the speed skating fraternity. He turned up to a car park at the National Exhibition Centre, Birmingham, where a track was laid out to the dimensions and shape of the complicated circuit that would be used at the forthcoming European Championships in the Azores. It was very wet, very cold and very windy day, but Harlow was on fire. With a point to prove he left everybody in his wake, Marriott included and the word on the street was that he would be unstoppable this season, but soon doubts started to creep in. Harlow carefully picked and chose his races and whilst he was placing in some he was not featuring in many. Questions were being asked as to whether he had peaked too early? His performances certainly were nowhere near as dominating as they had been at that squad session in March but he was still capable of holding his own. Soon it was time for the national team to be selected and Harlow's name was not on the team sheet. Sean McGeough and Tony Marriott were favoured for the sprints whilst Hugh Doggett, John C. Fry and Marriott were selected for the distances. Harlow had been left out in the cold. On 1st July 1989 Harlow took to the track for the 300 metres time trial British Championship, and in true Harlow style silenced his critics by winning. He opted not to skate the 20000 metres later that day but concentrated his efforts on the 5000 metres and 10000 metres the following day. The 10000 meters would never happen. In the final of the 5000 metres Harlow took a heavy fall damaging his thumb quite badly. Picking himself up he was heard to remark "I've had enough of this". Little did anyone realise just how telling those words would be. Harlow was taken to hospital to be patched up and was never seen at a race event again. It later emerged that Harlow had, in fact, been dealing with a medical condition that affected his back. Whether or not this was a reason for him walking away is not known. The constant battles with authority could not have helped and the feeling of being marginalised in favour of other skaters certainly didn't. But whatever the reason, the 2nd July 1989 saw one of Britain's most prolific international medal winners and greatest skating talents walk away from the sport for good. He was just 19. Ashley Harlow had accomplished many things in his skating career. He was a triple Junior European Champion, five times a Junior British Champion and nine times a Senior British Champion. He was a British Record holder and the youngest male skater ever to have won a Senior British title. No one will ever know what else he could have achieved had he stayed with it. Since those heady days Harlow has settled down with a family and made his other passion, landscape gardening, his business. Like his skating career his business is a success. 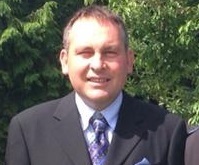 He has recently moved from his home town Herne Bay to live in the more rural Sandwich in Kent. To talk to he can still come across as the outspoken individual. Time has not altered that. But many people mistake his passion for brashness. I for one think he is a breath of fresh air and for many he will always be a British Skating Legend.